If you don’t work in law enforcement or live in California, you’re probably not familiar with Prop 47, a ballot initiative passed by California voters designed to reduce the state’s prison population and re-classify some non-violent crimes. If you do work in law enforcement, you’re probably aware that law enforcement officials are blaming it for recent increases in crime rates. But it’s not just California law-enforcement figures that are sounding the alarm on the Prop 47 crime-spike connection. Police in Las Vegas say Prop 47 is the reason they, like many other large U.S. cities, are seeing a spike in homicides. It’s a little bit like the “war on cops,” where people’s feelings don’t necessarily line up with real numbers. A retired FBI agent says the numbers aren’t as important as the impression they give. Retired FBI agent Robert Chacon says police know things that can’t be explained by data or fancy studies. “The Vegas cops are the ones who are out there every night dealing with these people in the streets,” Chacon said. “They know where these people are coming from because they are actually talking to them face-to-face, even the ones they don’t arrest. “If the street cops are saying they have seen an increase in contacts or arrests from Californians let out under the prop, it is pretty hard to argue that isn’t a cause,” he said. Tying the “prop” to spikes in homicide rates—not just in Las Vegas but in cities all over the country—will be a challenge, in terms of producing evidence as it relates to cause and effect. This article is nothing but opinion and supposition. 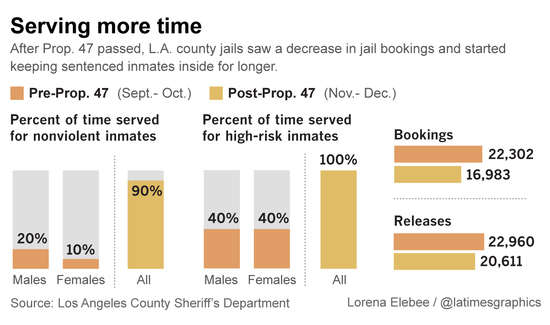 As the article stated several times, the prop primarily affects non-violent offenders. To make the assumption that the release of non-violent offenders increases violent crime is laughable. Expert opinions are not personal opinions or supposition. Expert opinions are worth their weight in gold… at least until every variable of every meeting is recorded so that it could be analyzed by an AI. That’s not happening soon.